« Fire Season is Hot! TT: Who Pays? How Pays? This week’s Wednesday Wandering announces the release of my newest novel. Yes! Fire Season, written in collaboration with David Weber, is now officially available. Also, if you’re wondering what the title was of the piece of art we chatted about last week, that has also been posted. Next, Alan and I conclude our discussion of the different ways medical care is paid for in our two systems. We had a lot of fun tracing the convolutions. JANE: In one of our earlier conversations, you surprised me by mentioning both your private medical system and the fact that you had medical insurance. Why would you need that if everything is paid for in your system? ALAN: Not everything is paid for. Dentists and opticians aren’t part of the public health system (I have no idea why) so medical insurance helps with those costs. And while visits to the GP and prescription charges are heavily subsidised, they aren’t completely free and so medical insurance helps to offset those small charges as well. Also, if you do happen to get caught in a long queue, with medical insurance you have the option of going privately and speeding things up a little. The company I work for pays my medical insurance premiums. If I had to pay them myself, I probably wouldn’t bother with medical insurance at all. It’s definitely a luxury, not a necessity. None of my friends have medical insurance. JANE: In a way, the more you describe this, the more it sounds like your socialized medicine is very similar to our private insurance systems. Jim and I have separate policies for optical and dental. ALAN: In my opinion, the two sound exactly the same apart from the vexed question of who actually pays for the treatment. We pay nothing at all for major tests and treatments and surgeries, and we pay trivially small costs for routine things like visits to the GP and prescription charges. And of course there are no arguments about what is and is not eligible for treatment. We don’t have to depend on the whims and vagaries of insurance companies. It’s all very simple – the system pays for everything and treatment is never refused. JANE: I agree, but in the end somebody has to pay the costs. We’ve heard that countries with socialized medicine have very high taxes to cover all of this. ALAN: It depends what you mean by high. The only direct tax I pay is income tax and that works out to about a third of my salary. Any interest I earn on money deposited in a bank is also taxed at the same rate. Then there’s an indirect tax called GST (Goods And Services Tax) which is like a rather complex sales tax. Shorn of the complexities, everything that involves an exchange of money has a 12.5% tax associated with it. Businesses also pay tax – but since I don’t own a business, I have no idea how that works or what the rates are. JANE: Ah… I’m a business and my taxes are decidedly weird. However, Jim works for the state. I’ll ask him how much of his check goes for taxes. Here in New Mexico, we pay federal tax, state tax, and sales tax on many items (but not food). Everyone one in the U.S. pays the feds, but the others vary from location to location. So I’d just be speaking for us, not for the nation in general. ALAN: But it would still give a useful point of comparison between your system and mine. JANE: All right, here’s how it goes. First, I need to explain that Jim can choose at what rate to have money withheld from his check. He usually chooses the highest rate because he’d prefer not to be surprised to learn that he owes more at the end of the year. So the figures for tax may be on the high side. Are you with me? ALAN: Yes, though I find the notion of choosing your tax rate to be more than a little odd. However, I can see that it could have its advantages. JANE: The total amount for state and federal taxes that Jim has withheld from his check amounts to about 16.4 percent. We also are taxed on the interest on our savings. In addition to this, Jim has 2.15 percent withheld to cover our medical care. Most of this is for general medical care, but we pay an additional .18 percent to have dental and optical insurance. Now, this doesn’t mean we have no further medical expenses. In most cases, we have a co-pay. ALAN: Hmmm… You certainly seem to pay less tax than I do. What’s a co-pay? JANE: A co-pay is the percentage we owe toward a particular procedure. In a few, rare, cases, like our annual “wellness” check-up, there is no co-pay. However, in most other circumstances we pay an additional fee. Some of these are quite low – $10.00 to $25.00. Some are a percentage of the procedure. So even though we had insurance, when Jim had his sinus surgery earlier this year, we got hit with an additional charge. We also have co-pays for prescription drugs. Again, many of these are very low, but some are not. One of the drugs Jim takes for his cholesterol was very expensive until a kind pharmacist came to our rescue with a coupon offered by the drug company. And, if you choose to take a drug not on your insurance company’s “list,” you may end up paying a much higher co-pay or even the full amount. So, I suppose you could say we pay to join an insurance company’s program. This in turn gives us access to lower – but not zero – charges toward any medical care that is covered by the program we chose. Do you folks have anything like co-pays? JANE: That is certainly a lot less than Jim pays for his – even with the discount coupon! One thing I don’t like about our system is that billing can be a nightmare, especially when the insurance company messes up and bills us for something that is covered. Last year, Jim spent ages on the phone with people straightening out that we were not to be charged for certain lab tests because they were included in our “wellness check-up.” He “won” in the end, but I found myself wondering how many people with less confidence or less persistence would simply have paid a bill – even if they didn’t owe anything – just because they received notification that they owed. ALAN: And I spend exactly zero time and zero effort on this kind of thing. My tax rate is a little higher than yours, but, on the other hand, I simply don’t have any significant medical expenses at all. I’m more than happy to make that trade off for the sake of peace of mind. JANE: I must say, there’s a distinct appeal. When Jim broke his hand some years back, the first thing I insisted we do was set up a file for all the billing paperwork that was certain to come in so we would not end up paying twice for something. How do people who don’t have a job get coverage? After all, 33% of your salary is something, but what if someone has no salary for the government to take 33% from? ALAN: The taxes that we pay fund the service and the service is available to everyone. If your circumstances are such that you have no income (and therefore pay no taxes), it makes no difference whatsoever to your entitlement to service. There are no exceptions – everybody gets free medical care. JANE: I believe your 33% also covers other government programs as well? ALAN: Indeed it does – there are a whole raft of benefits which kick in depending on individual circumstances. You can claim a sickness benefit if you are too sick to work, or an unemployment benefits if you lose your job, and so on and so on. The tax take funds all of these things. It’s probably a bit too complicated to get into the details here. Perhaps if our readers would like to know more, they will ask in the Comments. JANE: Sounds very good to me! This entry was posted on October 4, 2012 at 1:00 am and is filed under Thursday Tangents. You can follow any responses to this entry through the RSS 2.0 feed. You can leave a response, or trackback from your own site. Just to further muddy the waters, a 2006 comparison of the (ostensibly private) US system and the (ostensibly public) Canadian one found that total (combined state + federal) government spending on health care per capita was almost 23% higher in the US than in Canada. Thanks for the Canadian POV. One thing I really enjoy about the Thursday Tangents in general is when readers who live in other countries weigh in and provide yet another perspective on the discussion. It’s as if we’re all creating a gem with multiple facets, all of which give greater shine on the jewel that is the topic. To really get the average Canadian’s reaction to US health-care policy discussions, imagine you turned on the TV news one evening and learned that a hot topic of debate in the upcoming Mexican presidential election was whether or not indoor plumbing is a good idea. On an intellectual level you can understand the importance of the monetary contributions of the pooper-scooper lobby and the significance of wall-marking in the national psyche, but on a gut level one is left with a sense of befuddled bemusement. Actually, the difference in per-person payment can be seen at http://en.wikipedia.org/wiki/List_of_countries_by_total_health_expenditure_%28PPP%29_per_capita, and the US tops the list. It would be even higher if we somehow accounted for all the lost time people spent negotiating over those damn bills. That’s one big reason I favor universal coverage: it will cut costs and standardize prices for everyone. Unfortunately, it will cut costs by putting a lot of people in the insurance industry out of work, because a fair amount of the US health care spending is going into paying for negotiations within this byzantine industry. A bit more goes into lawyer-proofing against malpractice suits, by performing unnecessary tests, although I think that’s going away somewhat. In the US, I hate to say it, but being uninsured is a really bad idea, if you can get insurance. The problem is that you automatically get charged at full rate. If you have insurance with a big company, you pay at the discount rate negotiated by the insurer. Even if you can afford to pay in full, it makes sense right now to go through an insurance company who has the muscle to negotiate something cheaper. 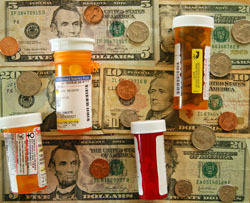 Another appeal of universal health care is that hospitals do provide a lot of free medicine, typically to the indigent through the emergency rooms, and this can get very, very expensive (homelessness, chronic physical diseases, substance abuse, and accidents add up to a nasty medical bill when that person gets wheeled in to the ER). My city even decided to take some number of the “worst offenders” and pay to have them housed and insured, because they were costing the city hundreds of thousands of dollars per person per year in uninsured health care. Everyone who knew about it thought it would be cheaper to get them off the streets, whatever it took. Hospitals already try to pass on those expenses through their bills to the rest of us, and it might be saner to simply spread the load around through taxes. As I have grown older, I’ve come to see “cost” for anything as something that needs to be accessed in three currencies: Time, Money, Stress. My neighbor likes to tinker with cars and changes his own oil, thus saving money. To me, the cost in Stress and Time would not be worth it since I don’t enjoy tinkering with cars. I do think that the Stress cost of our medical system — especially on people who are already under stress because of illness or accident — is one that is under evaluated. There’s a saying (commonly used by programmers these days, but I heard it from somebody in construction years ago) that expresses this pretty well: you can have it good, you can have it fast, or you can have it cheap. Pick two. That works. The saying I keep thinking of is that one person’s inefficiency and waste is another person’s career. All this seems to be in political flux right now in the U.S. (witness Wednesday/Oct. 4 night’s presidential candidates’ debate). We’ll know more after November. Even then we won’t know everything.